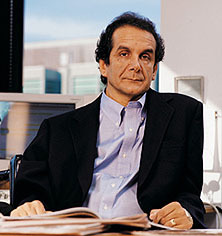 Charles Krauthammer writes today that he’d like to hold a reasoned discussion about end-of-life counseling. “We might start by asking Sarah Palin to leave the room,” he says. That’s “close to reasonable,” says Joe Klein. But no, it isn’t. Krauthammer is part of the swelling “Yes, but” crowd, and for my money these guys are infinitely worse than the flat-out nutters themselves. I mean, at least nutters have the excuse of being nutters, right? They can be dismissed or mocked or yelled at or whatever. But everyone outside the nutter base understands that they’re crazy. Then there’s the “Yes, but” contingent. Sober. Serious. Looking at all sides of the issue. Stroking their chins. Coming to conclusions. It’s not an outrage. It’s surely not a death panel. But it is subtle pressure applied by society through your doctor. And when you include it in a health-care reform whose major objective is to bend the cost curve downward, you have to be a fool or a knave to deny that it’s intended to gently point the patient in a certain direction, toward the corner of the sickroom where stands a ghostly figure, scythe in hand, offering release. Subtle pressure indeed. The only thing that’s subtle here is Krauthammer’s faux evenhandedness. Up until two minutes ago, politicians and pundits across the political spectrum universally believed that advance care counseling was an entirely sane and uncontroversial practice, one that any compassionate society would encourage. Those same politicians and pundits knew perfectly well that it was never about guiding patients in any particular direction and has never been motivated by cost savings in any way. They knew that other countries reimburse for advance care planning — just like any other use of a doctor’s time — and it hasn’t led to any pressure, subtle or otherwise, to pull the plug on grandma. They knew this. Until two minutes ago. But now they’re pretending — subtly, temperately — that maybe it isn’t true after all. And they’re doing this not because they’ve changed their minds, but because they want to kill healthcare reform for political reasons and they don’t care whether innocent bystanders get hurt in the process. Their “Yes, but” campaign might ensure that patients forevermore mistrust doctors who talk about advance care directives, but they also know that sober, serious, subtle op-eds endorsing this point of view are more likely to derail healthcare reform among the chattering classes than Sarah Palin’s Facebook maunderings. It is intellectual venality of the first order.